This is one substantial sandwich! We came home starving after taking the SATs, and it made the perfect lunch. What makes this sandwich so good, you ask? Well, it starts with a delicious herb butter with basil, thyme, dill and garlic. It’s pretty great on its own. 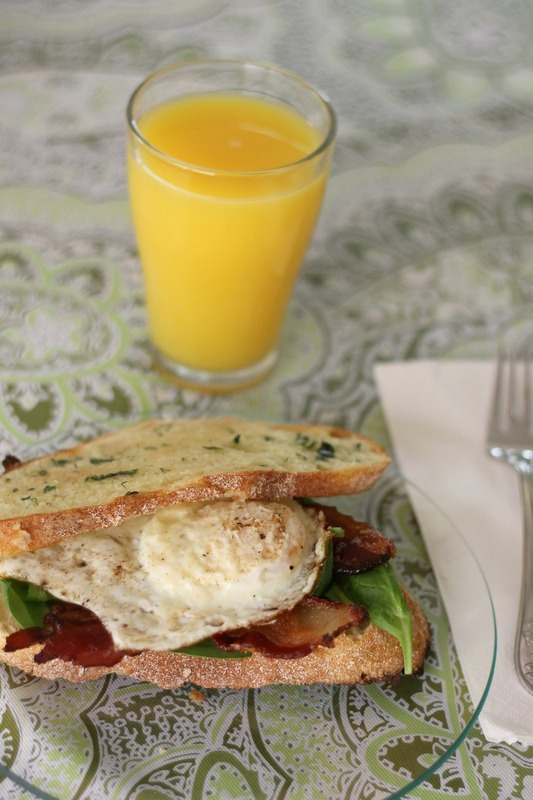 Then, you add some cheese, an egg cooked however you like it (a fried egg topped with a little parmesan is great), bacon (because a breakfast sandwich seems a little incomplete without bacon), and some spinach to lighten things up. Until recently, we have been bigger fans of breakfasts like waffles, pancakes, and bagels than the egg/bacon combination. This sandwich definitely changes things. Easy and delicious- what better breakfast could you want? In a small bowl, combine the 8 tablespoons of butter, the garlic, and the herbs. Stir to combine and set aside. Starting with a cold frying pan, cook the bacon on medium heat (350 degrees in an electric pan) until crisp. Set aside and let drain on paper towels. Spread each slice of bread with the herb butter; put the slices under the broiler until crisp and brown. Turn half of the slices over and top with cheese. Return only the slices with cheese to the oven until the cheese melts (keep the other slices on top of the oven to stay warm). You could also do this using a frying pan or a panini if you like! Meanwhile, cook your eggs. We wiped out most of the grease from the pan that fried the bacon and cooked the eggs there. Cook your egg the way you like- we fried them, but scrambled or sunny-side-up would be great too! When the egg is almost done, sprinkle with salt, pepper, and a little parmesan. 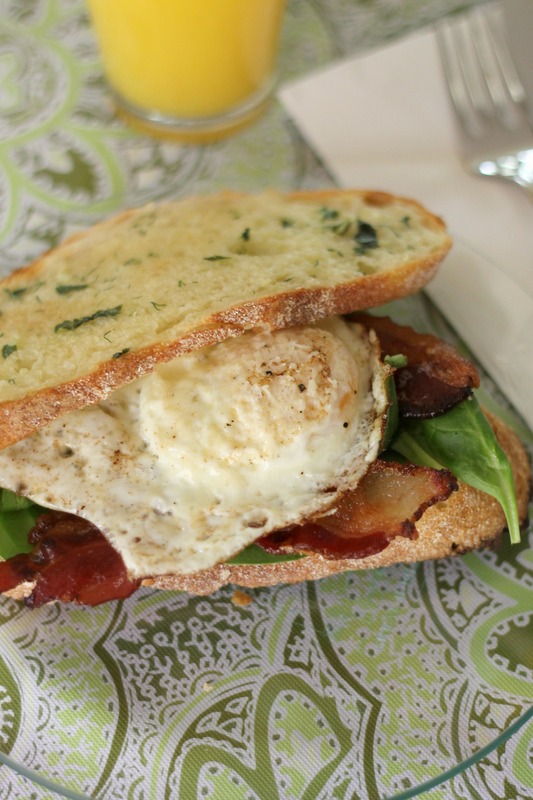 Top the toasted bread slices that have the cheese with a handful of spinach, a slice or two of bacon, and your egg. Top with another slice of bread and enjoy!